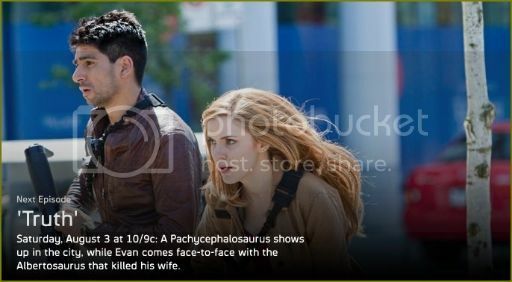 A Pachycephalosaurus shows up in the city, while closer to home Evan (Niall Matter) comes face-to-face with the same Albertosaurus that killed his wife. Directed by Stargate SG-1/Stargate Atlantis/Sanctuary's Amanda Tapping. Guest stars include Kimberly Sustad, Aleks Holtz, Kristine Cofsky, Fraser Corbett and Carolyn Adair.